Vereo Smart is the ultimate tool for manufacturers and integrators requiring a laser marking system for automated lines, assembly cells and more. 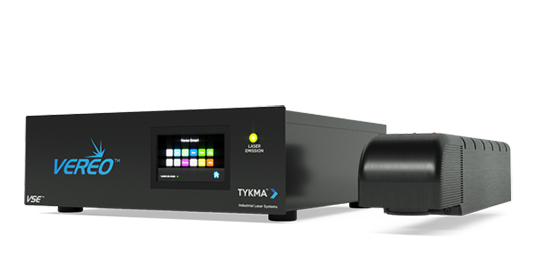 A maintenance free MOPA fiber laser source up to 50 watts can solve a variety of marking applications. Vereo Smart, equipped with an onboard controller, features a network interface to access the laser system from any device, for marking program management and modification as well as process monitoring. PLC connectivity for data control is easy to setup using a simple wizard. With a compact footprint, Vereo Smart is a powerful marking tool for any process. The system utilizes a complete standalone computer interface requiring no PC for operation, with marking programs being able to be created and loaded onto the machine. An embedded web interface allows you to set up, control, and monitor your laser system from almost any device on the same network as the laser. Features include a proprietary control system, control capabilities for connecting to PLCs for data transfer, and a compact and robust laser head.